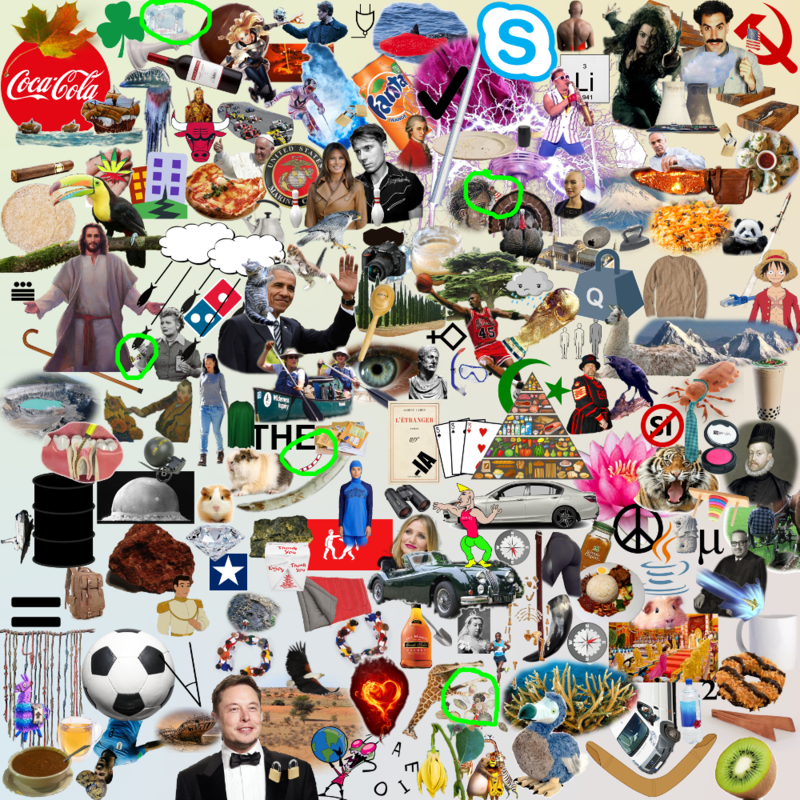 In this giant collage, solvers should look around until they notice the five Where's Wally characters hidden in the image: Wally, Wenda, Odlaw, Woof, and Wizard Whitebeard. 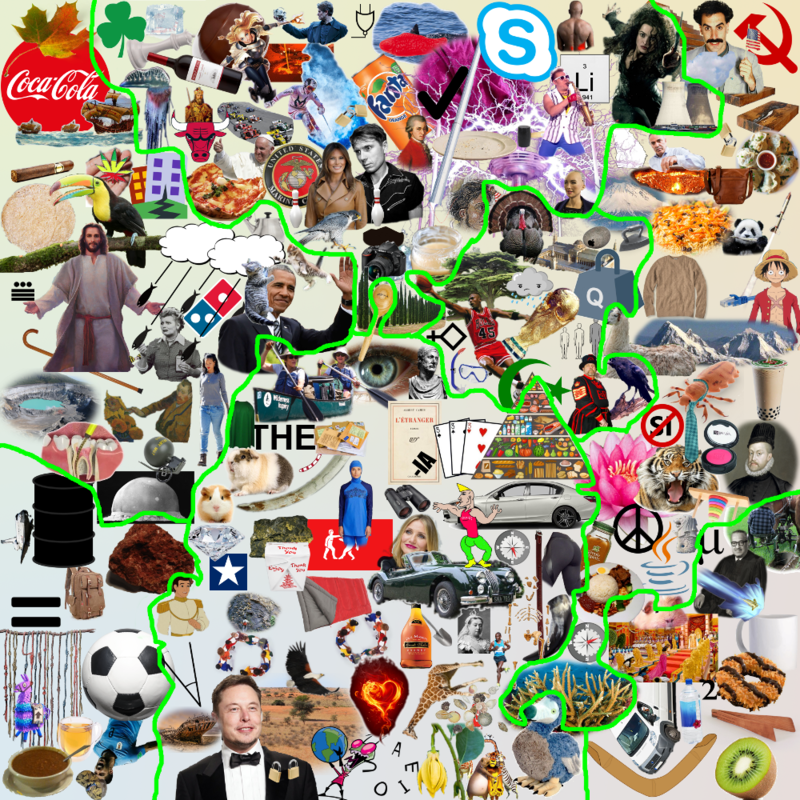 As for the collage, although it initially looks meaningless, after staring at the images for a while solvers should realize that they are looking at a map of the world. Each country has an image associated conceptually with the country (Elon Musk with South Africa, (food) pyramid with Egypt, lotus flower with India) or punning on the country’s name (a “Q Weight” for Kuwait next to some “Bah-rain” and an “iRock”) or in rare cases a clue for a major city of the country (a split in Croatia, Sophia the robot for Bulgaria). The images are laid out approximately geographically (as best as could be hoped for when the world map is compressed like this). 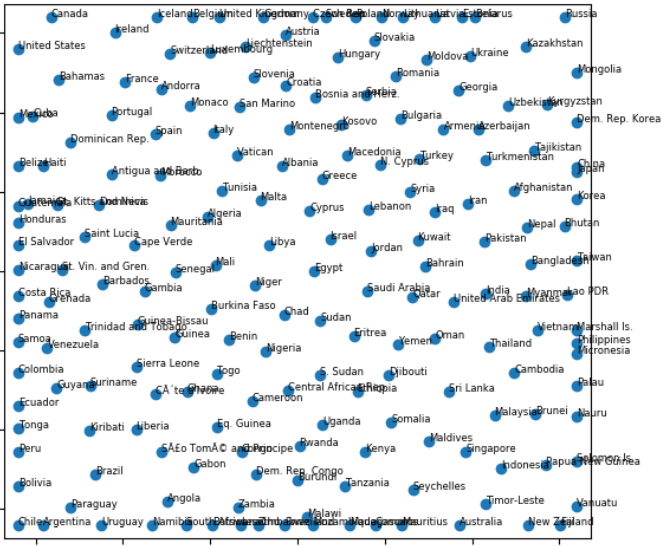 Answering the title question, the Wally characters are found in the countries Iceland, Turkey, El Salvador, Mali, Seychelles (ordered top to bottom). The first letters of these countries spell ITEMS. In the (non-original versions of the) original Where's Wally? book, readers also had to find twelve of Wally's lost items, exactly one per page. These items are also scattered about the collage. These images highlight the locations of the Wally characters, the continent boundaries (including the boundary of the Middle East), and the locations of the items. The full list of pairings between images and countries can be found after the Author's Notes. Whew! Evidently, this puzzle required quite a bit of research, image searching, image cropping, and image positioning. I used Gimp which was just suitable enough to do all the cropping and layer management. If I had to do it again, I might look for a code solution to crop the background out of photos (which would probably work for 70% of the images) and also to actually place the images with a good-looking amount of overlap. When all the image cropping was said and done, only the continent boundaries remained untouched! Somehow, neither of the two puzzles I wrote for this hunt had any text (this puzzle and Cuspidation). I guess that's something! Algeria The Stranger (book) The Stranger takes place in Algeria. Antigua and Barbuda Obama The highest point of Antigua was renamed to Mount Obama in 2009. Argentina Patagonia-brand hat No, the company doesn't have anything to do with the Argentinian geographic region. Bahamas Niña, Pinta, and Santa Maria These three boats touched down in the Bahamas when Christopher Columbus arrived in the New World. Belarus Bellatrix Lestrange Bella-tricks or a Bella-ruse? Benin Flag of the Benin Empire Ok, this flag with an image of decapitation may not actually be from Benin. Bosnia and Herzegovina Alex Kapranos Lead singer of the band Franz Ferdinand, whose namesake was assassinated in Sarajevo. Brunei peace sign The full name of Brunei is “Nation of Brunei, the Abode of Peace”. Bulgaria Sophia (robot) Sofia is the capital of Bulgaria. Cambodia rouge (makeup) The Khmer Rouge led a genocide in Cambodia in the 70s. Croatia split (bowling) Split is a major city. Denmark Hamlet Shakespeare's Hamlet takes place in Denmark. El Salvador Jesus The translation of El Salvador is “The Savior” i.e. Jesus. Estonia Skype Skype was created in Estonia. Fiji Fiji water bottle Fiji water is actually bottled in Fiji! Germany Fanta Fanta was invented in Germany. Haiti earthquake Haiti was very badly damaged by the 2010 Haitian earthquake. Indonesia Java programming language logo Java is the largest island of Indonesia. Iraq rock with Apple logo It's an “iRock”. Kenya Eliud Kipchoge He is one of many very fast Kenyan runners. Kosovo cosine function This is really faint in the collage, but if you look closely you'll see the graph of the cosine function. Formed in 2008, Kosovo has been only partially recognized as an independent state. Lebanon cedar tree Lebanon is famous for its cedar trees, which appear on the national flag. The Cedars of God are a world heritage site. Liberia American flag star Liberia was originally formed as a “repatriation society” of freed American slaves. Libya triple of 3s The capital of Libya is Tripoli = triple. Liechtenstein two locks Liechtenstein is one of two doubly landlocked countries (the other being Uzbekistan). Maldives coral reefs The Maldives has famously pretty scuba diving. Mauritania eye The Eye of the Sahara is a landmark if you're ever in the International Space Station. Micronesia Greek letter μ The SI prefix “micro” is written μ.
Moldova Epic Sax Guy This was an EPIC Eurovision submission by Moldova. Mozambique vowels Mozambique is the only country whose name includes all 5 vowels. Myanmar crossed out SI The United States and Myanmar are the only two countries that don't use SI units of measurement. Nepal llama Lama. Dalai Lama. Niger -IA The name is just a -IA away from its southern neighbor, Nigeria. Oman raven It's an “omen”. Pakistan cashmere sweater Pakistan, China, and India all lay claim to the Kashmir region. Paraguay yerba mate Paraguayans love their yerba mate. Qatar World Cup trophy The 2022 World Cup will be hosted in Qatar. Saint Lucia Lucy Ricardo Saint Lucia is the only country named after a woman. São Tomé and Príncipe prince “Príncipe” means “prince”. Senegal canoe The Wolof meaning of the word “Senegal” might be “our canoe”. Serbia tesla coil Nikola Tesla was Serbian. Sierra Leone diamonds Blood diamonds are a major problem in Sierra Leone. Singapore merlion Half lion, half fish, official symbol of Singapore. Slovakia velvet Czechoslovakia peacefully split in 1993 in the Velvet Divorce. Slovenia Melania Trump Melania Trump is Slovenian-American. South Korea Ethernet cable South Korea has the world's fastest average Internet speed. Spain bulls Running of the bulls and bullfighting are popular Spanish traditions. Sri Lanka turmeric bottle Once known as Ceylon, Sri Lanka is famous for its spice trade. Suriname bauxite Bauxite is a major export of Suriname. Turkmenistan "The Gates of Hell"
Uganda Queen Victoria Lake Victoria is a major component of the Ugandan biosphere. United Arab Emirates tallest The Burj Khalifa is the world's tallest building. United Kingdom queen (chess piece) Queen Elizabeth II has reigned since 1952. Uruguay Luis Suárez Suárez gained notoriety for biting opposing team members in the 2014 World Cup. Uzbekistan two locks Uzbekistan is one of two doubly landlocked countries (the other being Liechtenstein). Vietnam Tower of Hanoi Apocryphally, Vietnamese monks had to solve Tower of Hanoi with 64 disks by hand. This would take almost as long as solving The Ministry of Word Searches! Zambia African fish eagle The national bird of Zambia isn't a bald eagle, but it sure looks like one.